It is 1899 and the Union Pacific Express is headed to the Nice Valley Coal Company to deliver their payroll and 47 passengers. Suddenly the train is attacked by thievin’ bandits! Will the outlaws keep their cool or will Marshal Samuel Ford save the day and prevent the robbery? Why did we want it? 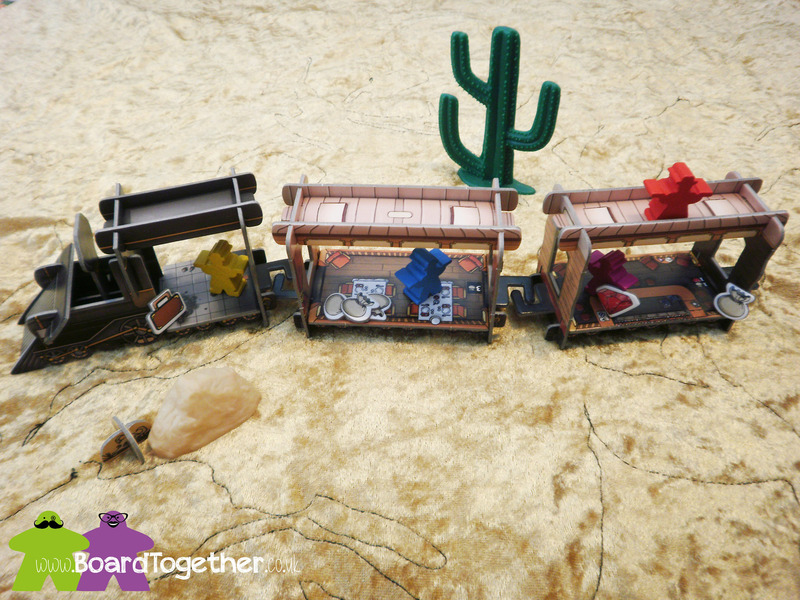 T – So I saw this all set up on a table at the UK Games Expo 2015, and thought how cool, a 3D train, but didn’t think much of it. My lovely husband also pointed it out to me, knowing I would like it. 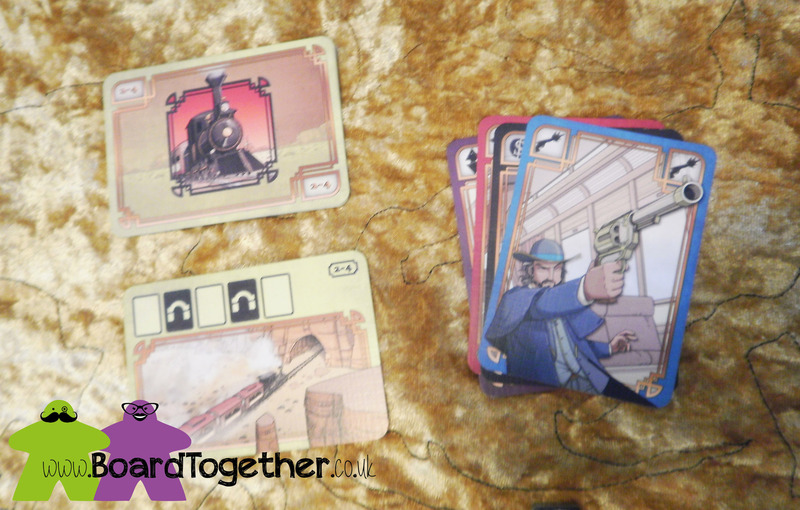 However I was on sensory overload and just did not pay Colt Express enough attention and it completely passed me by. Once home I read the review in the expo programme and got all excited pointing it out to a very patient husband who sighed quietly at me. 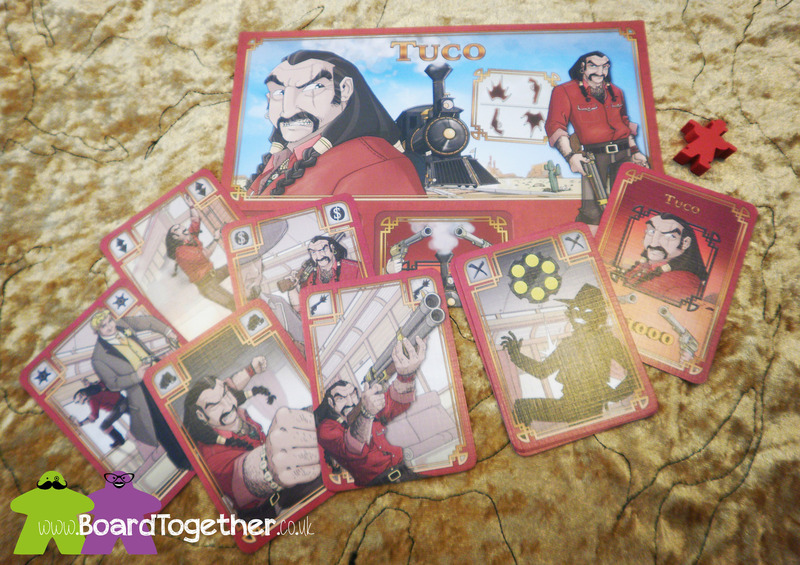 …and who doesn’t want to play as gun toting bandit stealing bags of loot of a train? Why did we keep it? T – The first couple of play throughs were a bit of a nightmare. First time we only played with two characters and wondered why the game was so short with little to no interaction. Second time we played the correct way in a two player game with two characters each, it soon became apparent neither of us had any sort of short term memory and got into a complete pickle with the action cards!!!! We have since played it with other people. Boy does it work sooooo much better. The shooting, the scheming, the looting from passengers and other players, that little bleeder the Marshal totally stuffing up carefully laid out plans. Yes this game can be played two player, but it comes into its own with four. M – It’s AWESOME! It’s a programed move game, so you make a plan by playing cards into a stack and then see if it actually happens the way you wanted. You see other players are also playing actions into the stack that may affect your character in a way you were not expecting and suddenly all those plans you had go all to pot. I picked up a game a while ago called Space Alert that has the same sort of programmed play but it was quite difficult to get the mechanics down. Colt Express doesn’t have this issue and has probably replaced Space Alert in our gaming collection. T – Pay attention! The action cards are chosen and stacked in order before play starts. So my strategy is to think about what I want to do, I don’t even try to guess what the others are up to. Then we all see what everyone else wants to do as they place their action cards face up. At that point, I react if I can. Normally to get away from the Marshal or a shooting! M – Going to echo what my wife says. This game is all about paying attention to your actions and also what others are going to do during the turn. There’s only a limited amount of loot on the train and if your good enough you can make a guess of what other players are going to do and try to intercept the loot or throw their plans out the window. Shooting as many of the bandits as possible is also a great plan as the bandit who fires the most bullets gets a bonus $1000 at the end of the game and that’s a huge bonus. T – Plays into the Wild West theme really well. The characters are all obvious but work well for the era of the game. I love all the little details inside the trains, like plush seats for first class and wooden benches for the riff raff!! M – The artwork is cartoon based and works really well with the cut out train. Think of a Wile E Coyote cartoons and you will be on the right track. (TRACK get it?). The characters are great and all round A+. T – Never have I had so much fun putting a game together. The instructions are very clear and easy to follow. You have to take care punching out all the pieces, as the artwork rips away easily. 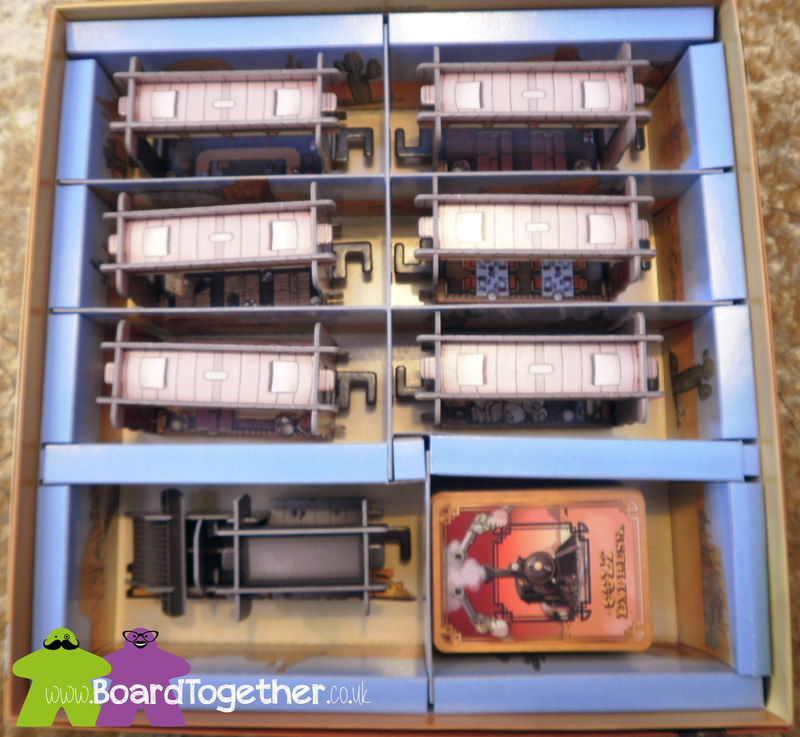 It also feels awkward pushing the bits together as you think you are going to damage the train. Once it is all together though the train is nice and sturdy. It then sits in the box all made up, so no taking it apart again. I did have a slight problem with left over bits! Took a while to figure out they were dividers for the box not extra scenery that did not fit together. My only gripe would be the moneybags, diamonds and lockboxes are just cardboard cutouts. It may keep the cost down, but there must be a way of making some cool tokens right? When we play the game we nick scenery from husbands Doomtown/Deadlands stuff. So we have a desert sand matt, wooden saloon, brothel and sherif office buildings. We even have really silly plastic cacti and rocks. The game does come with some cardboard cacti and some cool looking skulls though. M – The components are great. I’m one of those people that like to change out components in games by adding poker ships to Doomtown etc. but these fit in really well with the game and I love the little standees for cactus and skulls. 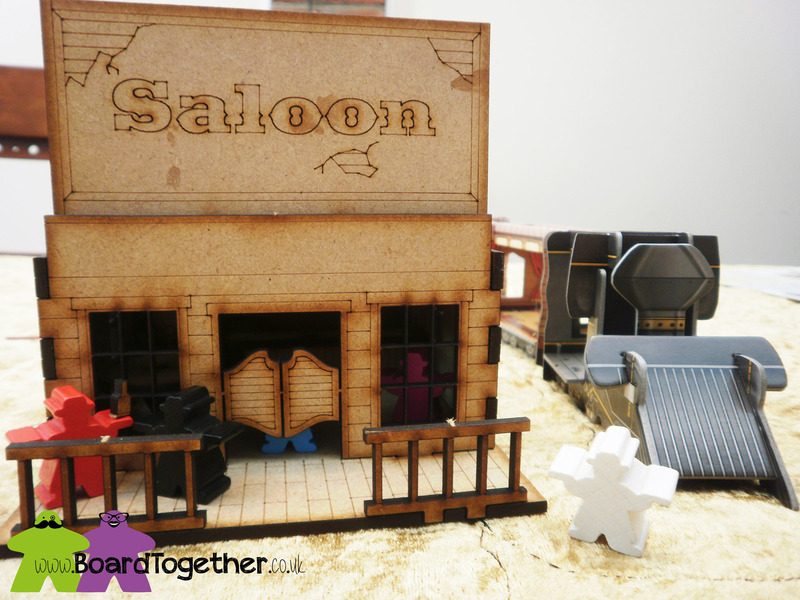 I will admit that we did play with some of my Malifaux terrain as it has a wild west theme in the background but it’s not needed. How it feels to win/lose? M – This game is not about the winning or losing it’s about the feeling you get when your plan comes off without a hitch. Move along trains roof -> shoot you friend in the back -> swing down into the carriage -> steal some loot -> BOOM! great feeling. Move along trains roof -> shoot thin air -> punched to a different carriage -> move down into the wrong carriage -> Marshal shoots you and your back on the roof -> nothing to steal -> SAD FACE! T – This game has a great theme and although easy to play difficult to get right, so you feel really rewarded when a plan comes off without a hitch. Recommend for gamers, not so much for people new to board games. M – This is a fantastic game and need to be in everyone’s collection. Plus my wife loves it so it sees a lot of table time. 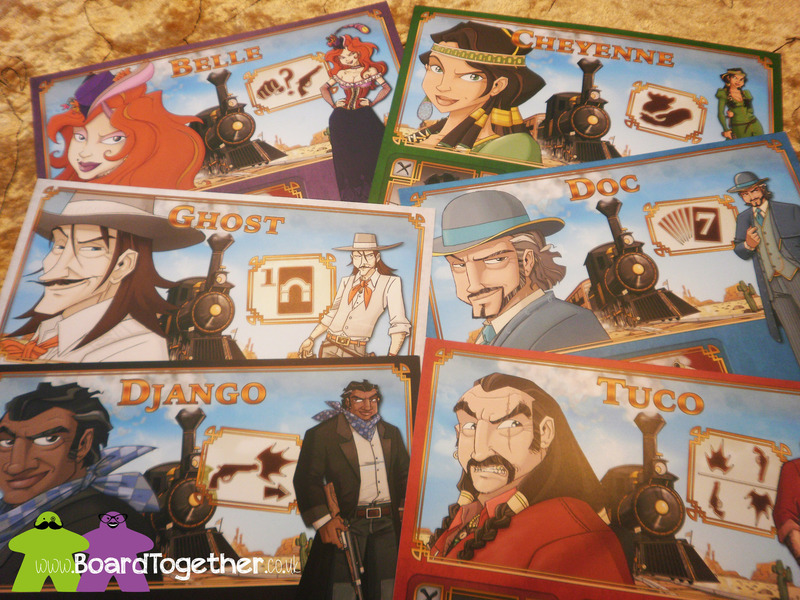 Update No 1 – Colt Express won Speil des Jhares 2015, and well deserved, best choice of games nominated this year. The object of the game is to be the richest bandit in the west after 5 rounds. At the start each player chooses a character and takes the matching meeple, action cards, 6 bullet cards and starting loot. At the start of the game your guns cylinder is full, so you can fire at other players to slow them down. You also compete for the $1000 gunslinger bonus given at the end of the game to the player that shoots the most. 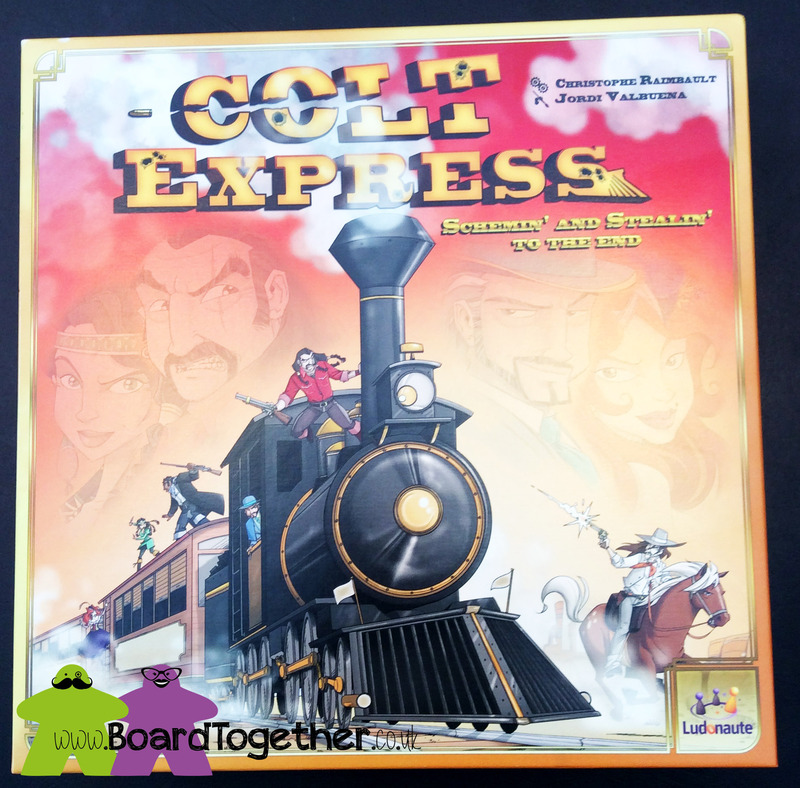 Colt Express is a pre-planned movement game played over 5 rounds with each round having 2 phases. A round is started by the first player who draws a “round” card and places it face up so all can see. The round cards show how many turns to take, how they will be played and an event that happens each round. So action cards are placed face up, unless you go through a tunnel, then your actions are hidden and played face down. The events range from the train braking so your meeple moves to passengers rebellion where meeples in a car with passengers get shot! Decide what you want to do this round and play the corresponding action cards to the common deck taking turns. Or draw three new cards to get the moves you need. Marshal – move the yellow marshal meeple one car in direction of choice. If he comes across a bandit the recieve a neutral bullet and must move to the roof of that car. You cannot shoot someone in the same car, they must be one away inside, but can be any car away on the roof. Robbery – take a loot token of choice from the car! Punch – target a fellow bandit in your car and they drop a loot token of your choice on the floor. They must then move one car away. Pay attention to what is being played, you can counter play and sometimes fix problems, or you end up with dirt in yer eye as the other bandits laugh at you failing miserably!!! The first player takes the common deck, turns it over and the action starts. Actions are performed with meeples moving, shooting and looting all over the place! Action cards must be played and cannot be ignored if the action is available. The game ends after 5 rounds, the gunslinger bonus is awarded and then the loot is counted up. Person with the most loot wins. Update No. 2 – Found out there will be expansions for this game around August 2015 and cannot wait to add them to this awesome game. 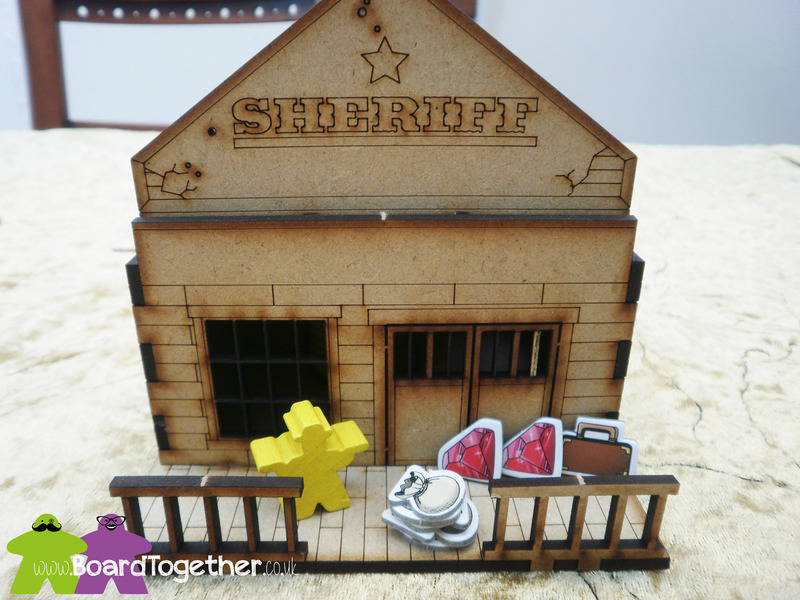 Horses & Stagecoach – Horse meeples and a 3d stagecoach! Marshall & Prison – You can play as the marshall and stuff everyones moves even more with shooting! Indians & Cavalry – no info, just the name.